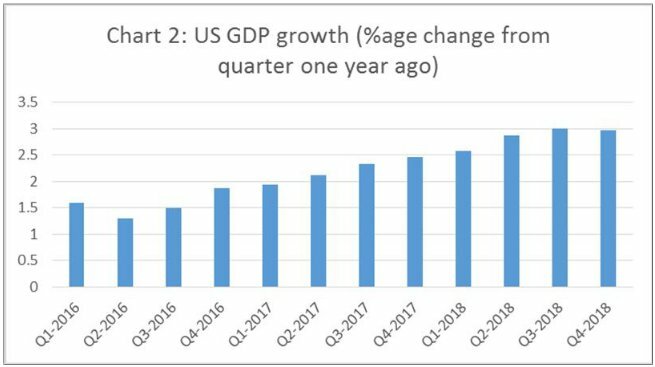 When the third estimate of U.S. growth in the last quarter of 2018 was released the euphoria exuded by forecasters of global growth even a few months earlier waned. 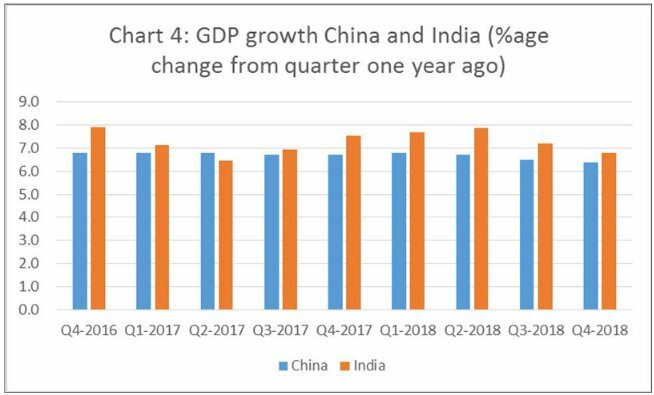 The annualised quarter on quarter growth rate that had risen to a more than comfortable 4.2 per cent in the second quarter of 2018, had fallen to 3.4 and 2.2 per cent in the subsequent two quarters (Chart 1). The quarterly rates measuring growth relative to the corresponding quarter in the previous year after having risen consistently have stagnated (Chart 2). 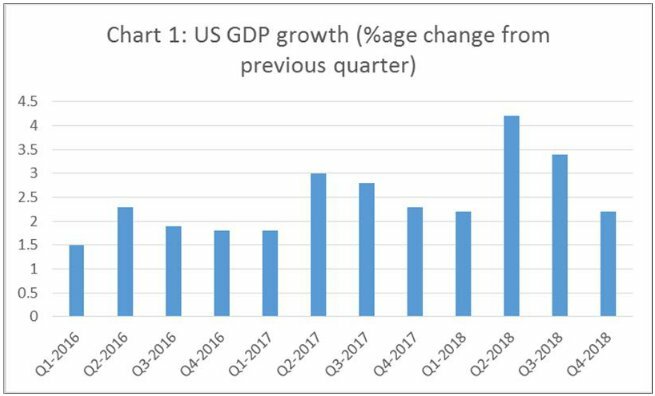 Once again it appears that growth in the U.S. is losing momentum, contrary to the optimistic projections of recovery that figures relating to the periods prior to the last quarter had generated. There are a number of messages that can be read into these developments, of which four are particularly significant. The first is that the stimulus to U.S. growth, if any, that the Trump tax-cuts and infrastructural investments had delivered, had lost its edge. The second is that the protectionist turn, focused on China, of the Trump administration was not triggering growth. The third is that though monetary policy initiatives involving infusion of liquidity and near zero interest rates had not helped deliver a recovery, that was the only option that governments seem willing to adopt. There are no signs, despite low inflation, of an effort to restore a role for fiscal policy, which could make a difference. And, the fourth is that uncertainties generated by the rise of unpredictable right-wing regimes and by the never-ending Brexit prospect have possibly had some dampening effect on investment and growth. For the world economy, these developments on the U.S. front are especially troubling, because the U.S. was expected to pull the rest out of a recessionary quagmire. Economies in the eurozone are languishing with annualised quarterly growth rates in the 19 euro area countries falling consistently since the third quarter of 2017 (Chart 3). From a high of 2.8 per cent in that quarter, growth is down to just 1.1 per cent in the last quarter of 2018. The long-term buoyancy displayed by Germany has given way to projections that the country’s growth in 2019 would be lower than 1 per cent as compared with earlier expectations of nearly 2 per cent. As compared with a peak rate of 2.8 per cent in the fourth quarter of 2017, Germany’s GDP rose by just 0.6 per cent year-on-year in the fourth quarter of 2018. C. P. Chandrasekhar is currently Professor at the Centre for Economic Studies and Planning, Jawaharlal Nehru University, New Delhi. He has published widely in academic journals and is the co-author of Crisis as Conquest: Learning from East Asia (Orient Longman), The Market that Failed: Neo-Liberal Economic Reforms in India (Leftword Books) and Promoting ICT for Human Development: India (Elsevier).